The chills come thick and fast as voodoo and terror meet within an innocent-looking doll inhabited by the soul of a serial killer who isn't ready to die. From the director of Fright Night comes a clever, playful and stylish thriller with excellent special effects and heart-pounding suspense guaranteed to scare! After 6-year-old Andy Barclay's (Alex Vincent) babysitter is violently pushed out of a window to her death, nobody believes him..
One of film's most notorious killers is back to wreak more mayhem as Chucky continues his quest to possess the body of a human child. Eight years after seemingly destroying the killer doll, Andy Barclay (Justin Whalin) turns 16 and is placed in a military school. Meanwhile, the greedy president of Play Pals Toy Company decides to resurrect the popular Good Guys doll line, confident that all the bad publicity is forgotten. As the assembl..
For 10 years, the tortured soul of serial killer Charles Lee Ray has been imprisoned inside a child's doll. "Chucky" is reborn when his old flame, Tiffany (Jennifer Tilly), rescues his battered doll parts from a police impound. But Chucky wants his new playmate cut down to size, so he transforms his blushing bride into a stunning little terror. Chucky and Tiffany can't wait to start their own homicidal honeymoon. When this demonic duo h..
Everyone's favourite killer doll returns and he's bringing the entire family! 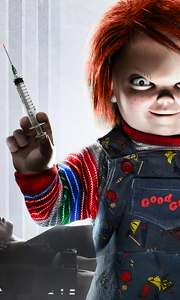 This time around, Chucky (voiced by series star Brad Dourit), and his homicidal honey, Tiffany, are brought back to life by their orphan offspring, Glen. Then, the horror goes Hollywood as Chucky unleashes his own brand of murderous mayhem! Featuring Academy Award nominee Jennifer Tilly (as herself and the voice of Tiffany) and hip-hop star Redman, it's more g.. He's back! From the filmmakers that brought you Chucky comes the terrifying return of the pint-sized doll possessed by the spirit of a notorious serial killer. When a mysterious package arrives at the house of Nica (Fiona Dourif, True Blood), she doesn't give it much thought. However, after her mother's mysterious death Nica begins to suspect that the talking, red-haired doll her visiting niece has been playing with may be the key to th..
You may feel a little prick. Confined to an asylum for the criminally insane for the past four years, Nica (Fiona Dourif) is wrongly convinced that she, not Chucky, murdered her entire family. But when her psychiatrist introduces a new group therapy tool - a "Good Guy" doll - a string of grisly deaths plague the asylum and Nica starts to wonder if maybe she isn't crazy after all. Andy (Alex Vincent), Chucky's now-grown-up nemesis from t..
Set a play date with Chucky - America's favourite killer doll - with the Chucky: Complete 7-Movie Collection. In Child's Play, Child's Play 2 and Child's Play 3, Chucky torments the unfortunate young Andy Barclay. In Bride of Chucky and Seed of Chucky, the bloodthirsty toy meets his demonic doll of his dreams, Tiffany (Jennifer Tilly). Chucky returns for more terror in Curse of Chucky, where the murderous moptop terrorises a family with..